After a much needed win against Carleton in the biggest game of the season at the time for the Golden Hawks, a fourth win before matching up with Western for the season finale was crucial. A 39-24 win against the Windsor Lancers was just what the doctor ordered as Laurier managed to move up to 4-3 and the fifth spot in the OUA. The fast start to the game for Laurier was nothing new as the Golden Hawks managed to go up 13-0 by the early portion of the second quarter. This was behind a strong run game that was utilized well in questionable conditions, led by Levondre Gordon who had 90 yards and a touchdown in the first quarter alone. Once Laurier went up 13-0 though, this game took a left turn. Windsor found something within them to score 19 points and allowing two more for Laurier by way of a safety to go up 19-15 at half. The second half was all Laurier as a crazy sequence that led to 16 unanswered points for Laurier. After a fumble by Levondre Gordon at about the midway point of the 3rd quarter, the snap went over the head of Sam Girard on Windsor’s first play of the drive and into the end-zone as he recovered it which was a safety for Laurier. On the next drive, Laurier went 68 yards on four plays and scored on a 19-yard Kevin Wong touchdown. Following that was a Marvin Gaynor fumble in the end-zone on the kickoff that Esson Hamilton of Laurier recovered for a touchdown to go up 31-19. “We didn’t play as well as we should have, particularly in the second quarter. Got off to a lead and a decent start, the wind definitely played a factor in us getting the lead in that first quarter. We kind of regrouped at halftime and said our season’s on the line and in the second half, won the game 24-5. It really was a tale of two halves and I’m glad we played our best football in the second half,” coach Faulds said. Records also came to fall in this game as receiver Kurleigh Gittens Jr. broke the former Lancer Jordan Brescacin’s OUA record for career receptions (193) in the first quarter. In going on to catch seven more balls, he became the fifth U Sports player ever to record 200 career receptions. One change that has been good for the Golden Hawks over the last couple of games has been the change at quarterback with Connor Carusello now being the starter. After putting up huge numbers in his first start against Carleton in that 37-31 victory, he did enough to help Laurier get their fourth win. “I’ve been pleased. Obviously these are the first two starts that Connor’s had, he’s doing a good job managing the offence. The conditions weren’t great last Friday and we chose to have more of a run focus offensively,” coach Faulds stated. Sitting at 4-3, the biggest game of the year awaits the Golden Hawks as they travel to London to play Western on October 20. “But we know against Western, we’re gonna have to stay balanced. We’re gonna be balanced and Connor is gonna be a big part of that. I think he’s smart enough to realize what great weapons he does have outside. So finding the space and time and making the right reads to get the ball in those athletes’ hands,” coach Faulds said. Not only will this be the biggest game of the season for Laurier as their playoff hopes depend on it, it will also be the biggest game of Carusello’s career. 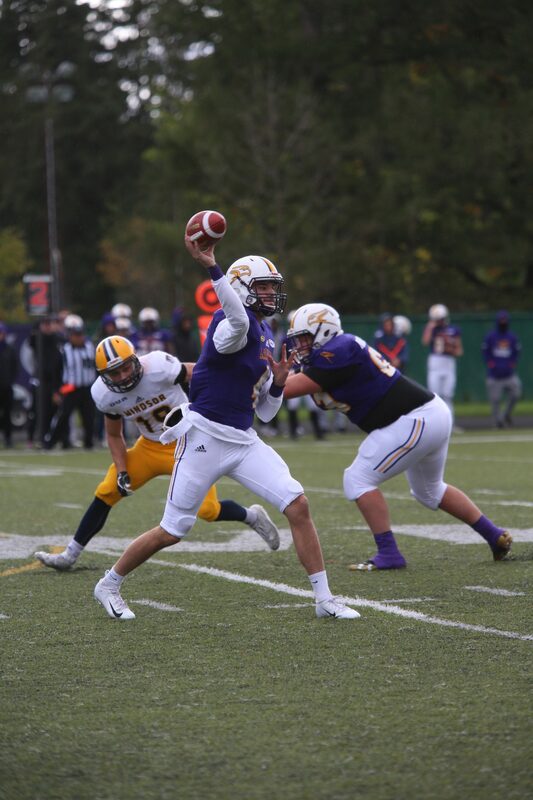 With the odds stacked against them in what has been a shaky year for the Golden Hawks, they will be looking for a complete team effort led by their young quarterback to avenge their Yates Cup loss to Western a year ago.